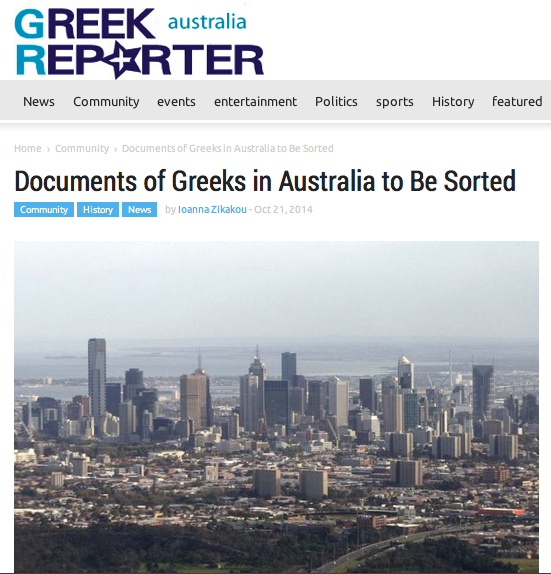 Thousands of documents that record the presence of Greeks in Australia can be found at La Trobe University in Melbourne. The so-called Dardalis Archives were collected after the significant donation of Greek-Australian croesus Zissis Dardalis. The precious documents were almost destroyed after the abolition of the National Center for Greek Studies and Research (EKEME). However, after many struggles, they were saved and are now in the process of being sorted. “This is an important procedure that fully satisfies us and gives us the reason to initiate the next steps for the use of the material to the fullest extent,” said Society of Hellenic Studies President Tassos Revis, who has played a leading role in saving the documents. La Trobe University has agreed to fund the three-year program for sorting, recording and evaluation of the documents which will be put on the internet so that they are easily accessible to researchers. “This is a treasure that was entrusted to us by the Greek Diaspora and belongs to society. This was the donors’ original plan and we must respect that.